that focuses on old-school values with state-of-the-art techniques. We are committed to installing, repairing, replacing, or removing any issues you might have with an approach you can be comfortable with. Our open-door, open-conversation attitude allows you to ask any questions before, during, or after any job. Contact us today, because better does matter! 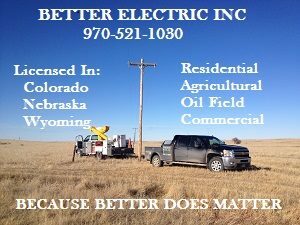 better electric is here to help…….. If you have any questions or concerns about an electrical issue, we will gladly help you determine what the issue is, and discuss with you the options available. We can be reached 24-hours a day to guarantee an answer or response.